As an Explorer, Meghan Schorman's pitching record made her an area standout. 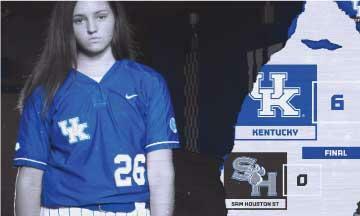 She continues to be noticed as a University of Kentucky Wildcat. After her senior year Meghan was named to the First Team-All Metro, the Illinois Coaches Association Class 2A All-State Team and the 2018 PSC All-Conference Honors. Fastpitchnews.com has added MCHS grad, Meghan Schorman to the short list of freshmen players to keep an eye on. As we move into conference play across the country, take a look at the nation’s most impactful freshmen, the stat lines they are putting up, and the big ways they are contributing to their respective teams. The players on this list are highlighted and expected to make the NFCA National Freshman of the Year list that comes out in the coming weeks. 1.87 ERA over 30 innings of work, 4-0 in 10 appearances with 30 strikeouts. Click here to see the full list of freshmen mentioned.